Each month, we will make our special downloads for the upcoming Li'l Woolie available. 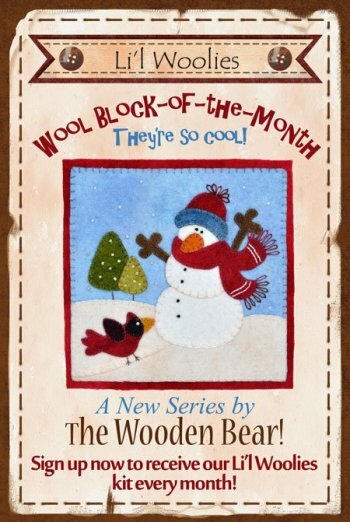 You have permission to use these on your website, blog, and Facebook, to help promote your own Li'l Woolies Club! 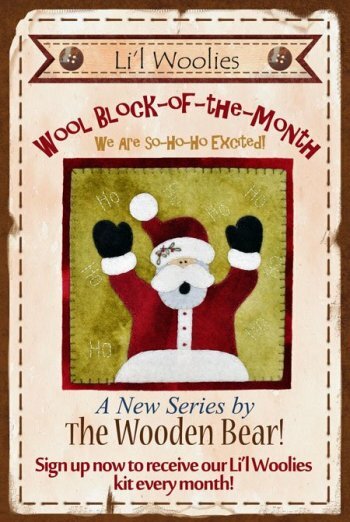 Click here for the chart showing wools and threads used for each month. 1. Select Save Image As, and save the graphic to your computer for use. 2. Select Copy, and then paste directly onto your website, blog, or Facebook. If "paste" does not work, try clicking on "Ctrl" and "V" on your keyboard at the same time. For pdf's, simply click on the link provided. 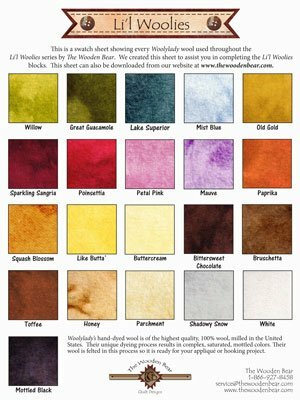 This is a pdf swatch sheet showing every Woolylady wool used throughout the Li'l Woolies series. 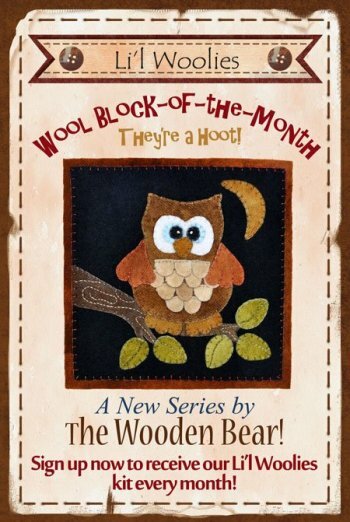 We created this sheet to assist you in ordering, and your customers in completing the Li'l Woolies blocks. On each Li'l Woolies pattern, we refer to to these wool names. 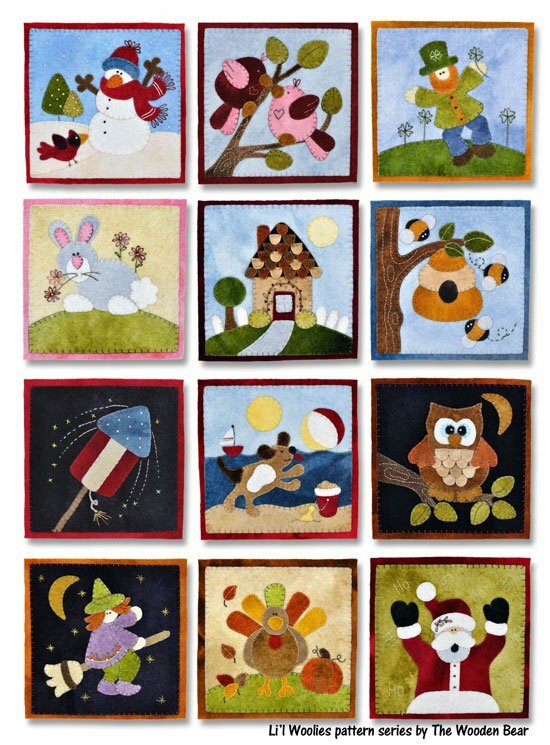 Click here for a printable pdf of the swatch sheet. Click here for a downloadable pdf of the flyer above! We have provided the flyer above for you to hand out to your customers. This way, they know exactly what blocks they can expect each month. We kept this flyer fairly generic, to allow for your own shop's customization of the club, but thought it could be a useful tool to help promote the club, and save you time! 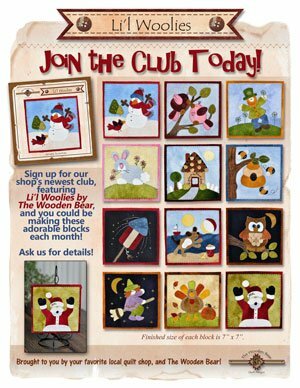 You have permission from The Wooden Bear to download and copy this flyer, to be used to promote the Li'l Woolies club in your shop. post to your website, blog, Facebook, etc. We had a shop request these because they saw us using them at market in Houston. We packaged the patterns together in a bag, tied with jute or raffia and added the tag. Click on the picture below to download the pdf to print. Enjoy! This one is a jpg sized at 350 pixel width, making it a good size for most applications. If needed, some applications allow you to resize. Use the directions at the very top of the page for either saving or copying. If you would like a .pdf of one of the three graphics above, that prints out at approximately 7" x 10 1/2", click on one of the links below. These make great signs for printing and displaying in your shop for sign-ups! This is a good graphic to display on your website, blog, or Facebook showing which Li'l Woolie is coming up, or which one is the current block of the month. These could also be used for tags or labels on Li'l Woolies kit packaging. This one is a jpg sized at 350 pixel width, making it a good size for most applications. If needed, some applications allow you to resize. Use the directions at the very top of the page for either saving or copying. This one is at 150 pixel width, making it a good size for a "click-on" button on your website's homepage. Use the directions at the very top of the page for either saving or copying. This is a taller version with the Wooden Bear emblem, also at 350 pixel width. This is a good graphic to display on your website, blog, or Facebook showing which Li'l Woolie is coming up, or which one is the current block of the month. These could also be used for tags or labels on Li'l Woolies kit packaging. Use the directions at the very top of the page for either saving or copying. Refer to instructions at top for downloading/copying images. Also, refer to descriptions on January's Graphics Set for image sizes and ways to use these graphics.